Having created incredible, but invisible, visual effects for Steven Spielberg’s War Horse, Framestore returned for Lincoln, the director’s take on the President’s efforts to have the Thirteenth Amendment passed by the United States House of Representatives. We sat down in London with visual effects supervisor Ben Morris and CG supervisor Mark Wilson to discuss some key shots from the film. Watch the trailer for Lincoln. Aboard the Malvern, Lincoln witnesses Petersburg under attack from his forces. Framestore crafted a CG river, banks and the burning city – using both live action elements and digital fire and smoke. The river surface relied on Framestore’s Tessendorf displacement shaders. Destruction of the buildings was realized with Framestore’s in-house version of the Bullet solver called fBounce. Houdini was then used for the fire sims. The shot was rendered in Arnold, and augmented with live action elements like additional smoke and fire. “Actually, some of the explosions in there are elements from War Horse,” notes Morris. “As you bring a shot together like that, we really just kept adding ideas. I think the mixture of CG and real elements give the shot a real, textural feeling”. Elements isolated and CG Capital rendered. Doubling as the Capital Building was the Virginia State Capital in Richmond, often used in films to double as its Washington counterpart. Framestore made a number of alterations to the building for key scenes occurring outside, including Lincoln’s famous second inaugural speech in 1865. 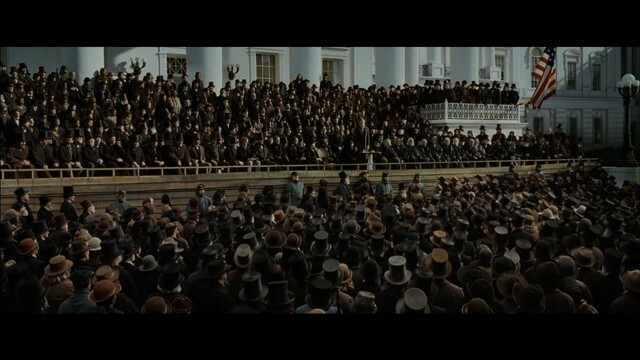 The final building was rendered in Arnold, with Framestore also contributing crowd replication and extensions for the speech and other scenes at the Capital. Framestore’s other Lincoln contributions are an array of seamless effects additions, fixes and wizardry. Here’s a rundown of how the studio helped tell Spielberg’s story. Carriage clean-up – in one shot of a carriage door opening, a member of the lighting crew obscures Hal Holbrook’s face in the reflection of the window. Framestore re-constructed the plate to match a different take of the scene. Artifact removal – Although the production filmed in Petersburg to take advantage of its period buildings, certain modern-day artifacts such as powerlines and background elements were unavoidable. In one scene following Lincoln in a carriage, Framestore removed a radio mast and numerous telephone poles and wires, relying on photo reference taken of the surrounding buildings to do the clean-ups, and also added in the Capital dome at the end of the street. Bloody battle – For muddy battle shots, stuntmen performed the opening scene for hours on end, with Framestore carrying out a bayonet and weapon enhancements and blood removal/additions.